Ultrasonic pest control devices produce a high-pitched sound that's intended to be audible only to pests. Intended to drive insects, rodents and other pests away, these devices may also affect other animals. Many homeowners wonder whether it's safe to use this type of pest-control method around their pets, especially rodents or invertebrates. According to Washington State University, the sounds from ultrasonic pest control devices don't carry far. They lose about half their energy within 15 feet and are ineffective at 30 feet. Objects placed in the way of the sound, such as a couch or table, can also block the device's effects. This could permit pest animals to hide behind large pieces of furniture to avoid the sound. Rodents are already prone to run along walls and under furniture for protection from predators, which decreases the effectiveness of most ultrasonic repellers. According to Rat Behavior, ultrasonic frequencies are sounds above 20 kHz (or kilohertz, a measurement of radio frequencies)–anything higher than a human can hear. Rats and other rodents are capable of hearing up to around 90 kHz. 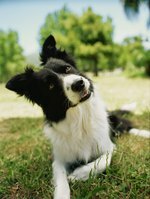 Dogs can hear up to 40 kHz and cats up to 60 kHz. This means that many of the ultrasonic frequencies that can be heard by pest animals can also be heard by pets in the home, especially if those pets are related to the pests homeowners wish to drive out. Ultrasonic devices have not been shown to be effective against pests. According to Washington State University, if a sound or frequency doesn't bother humans or pets, it is unlikely to bother pest animals. Rat Behavior notes that ultrasound works no better at repelling wild rats and other pests than audible sounds. Any sound strong enough to repel pest animals is also likely to upset pets like gerbils, hamsters and domestic rats. Even irritating sounds may not be effective. According to Rat Behavior, rodents quickly become accustomed to repeated noises. While the ultrasound from an ultrasonic pest repeller might be startling at first, mice and rats will usually return to their routines once they realize it can't hurt them. While this is good news for owners of rodent pets, it's bad news for homeowners who want to rid their houses of pests. It's possible to use ultrasound to create neurological damage, but this requires sound of extreme intensity. According to Rat Behavior, an ultrasonic device capable of causing convulsions and damage in pest animals would also do so in humans, cats, dogs and other domestic animals. Commercial pest control devices use much less intense sounds. Which Birds & Animals Produce Ultrasonic Sound? What Do I Do When My Dog Gets Bit by a Rat?